Bluegums Cabins is the perfect place for that romantic getaway in a beautiful cedar cabins surrounded by nature, just over 2 hours from Sydney and a shorter drive from Newcastle and Port Stephens. Our LilyPond cabin has a log fire for winter (firewood supplied) and air con and fan for summer. Relax in the hammock or in the double spa bath. Each cabin has beautiful handcrafted stained glass windows, a double spa bath and a 4 poster bed. We are located in the Barrington Wilderness Estate, close to Chichester Dam on 180 acres which you are free to explore with bushwalks, dams, a salt-water swimming pool, tennis court and amazing wildlife. 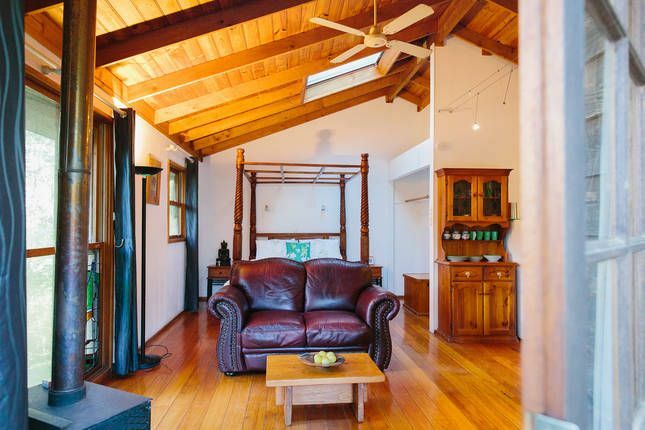 The cabins have an open plan layout and are fully self-contained with a fully equipped kitchen (from coffee plunger to dishwasher), a verandah, bbq and hammocks. Prices from $185 per night midweek - $195 weekends with discounts for longer stays so please contact us directly for special deals at our Bluegums Cabins website or phone number which can be found using google. All cleaning products are earth friendly and we use 100% certified organic cotton towels. Sit back and watch nature, great walks, drives, tennis, swimming, fishing, bicycling, horse riding - Choose to do it all or do nothing at all ! Watch the wildlife from your verandah from your parrots, wattle and bower birds , listen to the bell birds. Wallabies and patamelons are regular visitors. Visit some of the beautiful walks and water holes in the world heritage listed Barrington Tops national park, we can provide detailed maps of some beautiful places to swim, some more secluded than others. In the lower valleys of the park, you'll find subtropical rainforests and up on the plateau, there subalpine woodland which can have snow in winter. Most of the area is declared wilderness, and it's a well-known destination for bushwalkers. But the park is accessible even to those with limited mobility. The park's varied environments are home to a wide range of plants and animals, and it protects more than 50 rare or threatened species. Visit the wineries at historic Stroud and Gresford or a short trip to Dungog or Morpeth with it's great famous bakery, cafes, art & gift shops.. Treat yourself to a luxurious massage in the comfort of your cabin. (Must be booked in advance) Sealed roads, all the way. Our GPS Coordinates:- E 151.41.02 - S 32.14.40. MINIMUM STAY WEEKENDS - generally 2 nights but check our calendar for gaps & then contact us. LONG WEEKENDS - 3 nights. EASTER WEEKEND - 3 nights. * NORMAL RATES DO NOT APPLY TO Christmas/New Year period, Easter, long weekends and some holiday periods. The bathoom has a double spa bath, perfect for relaxing in after a day exploring. Our cabins are located on 180 acres of bushland near to Chichester Dam, in the foothills of the Barrington Tops National Park. Beautiful forests and green hills and rivers to explore. Relax on your deck in a hammock or on the outdoor furniture and watch the wildlife go by. Beautiful setting surrounded by bush. Wallabies abound. Balcony to soak up the ambiance. Everything we could want to get away from the hustle and bustle of the big smoke. I can't thank my beautiful partner enough for organising such a first class weekend surprise for my birthday. Thank you my Darling. Thank you very much Alan for the lovely review. We hope to welcome you back to Bluegums again. We decided not to stay our two night stay after one night in the Lilypond Cabin. I’m not sure what the refund policy is, but the cabin and property are not a reflection of the advertised website. We had been on a beautiful travelling holiday for two week staying in amazing accommodation and were very disappointed to end our holiday at Bluegums Lilypond Cabin. When we arrived late afternoon the cabin was so hot that the set temperature air conditioner could not cool the cabin. Everything seemed to need a wipe over before we could use it and the bed was so uncomfortable and noisy to sleep in that we woke each other every time we moved. We did try to walk around the property and to the pool as mentioned online but everything is over grown so this wasn’t possible. The cabin had lots of spiders, a dragon fly and blow fly that spent the night with use also. We only used two plates and two glasses after rinsing them for use and placed them in the dishwasher which the door doesn’t close on so couldn’t be used. I would have hand washed but no tea towel was left. I thought I would give the owners the courtesy of letting them know we were leaving by calling them to discuss but we had no service with either Optus or Telstra at the cabin so I sent a message when we had service away from the property. I received no reply. The Lily Pond cabin was simply stunning. It had everything you could need but the peace and quiet to just truly relax. Sitting near the pool watching the wildlife was a bonus. We had an amazing weekend and will definitely return. really appreciate the lovey review. Thanks Reece, see you again hopefully. Cosy cottage, especially in the evenings with the log fire going. Nice location in amongst the trees and we enjoyed the tranquility and privacy and experienced the local wildlife including a very friendly possum. Well equipped kitchen and the webber outside allowed us to snuggle in and cook both nights. Day time exploring was also fun including the loop walk at Williams River. We highly recommend this place for a romantic getaway in an area which has plenty of lovely scenery to explore! If you are after a relaxing break this is the place to be. Guests love the peace and quiet and the abundance of wildlife which includes wallabies, king parrots, bower birds and if you are very lucky a koala or echnidna. You don't even need to leave your deck to see these. Our cabins are set up with everything you need to enjoy a break, all you need to bring is your food and drink. We are a 20 min drive from the friendly town of Dungog which has antique stores, art galleries, cafes and a micro-brewery.